Grab the best car rental deal for Gold Coast Airport, offered exclusively by Global Car Rental at the best prices. Car hire deals are offered from the well-known best suppliers in Australia. Gold coast, a perfect destination spot for the beach lovers, is comprised of long sandy beaches and a system of Inland canal and waterways. 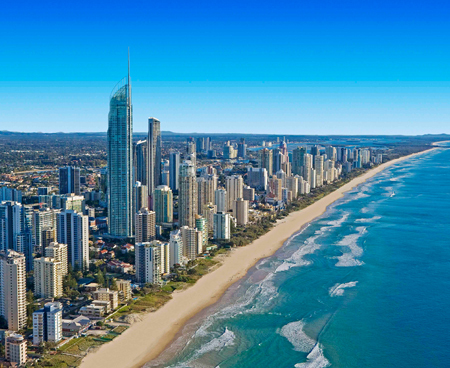 The easiest way to access this beautiful place is renting a car at the arrival itself on the Gold Coast Airport. Global Car Rental offers car rental deals exclusively from the best car suppliers that are just not limited to Australia. Following our 3 step booking process, travelers can book a car in an extremely easy manner; just search for the rental location, choose the car and make a reservation, it’s as easy as that. Gold Coast Airport is an International Airport and is the gateway to the Australia’s one of the most beautiful holiday destination, the Gold Coast. It is the only Airport that is situated in two states at the same time. Its runway runs in between the New South Wales and Queensland, but the OOL Airport follows the Queensland time zone throughout the year. It is termed as the third fastest growing airport and the sixth busiest Airport in Australia. Travelex has it’s own currency exchange office at the International Terminal while it also offers several ATM’s throughout the Airport dispensing several Foreign currencies. Several restaurants and cafes can be spotted on both the landside and airside of the Gold Coast Airport. Free WiFi is offered by Gold Coast Airport; aside that, Internet Kiosks can also be found at both the terminals. Travelers traveling in economy class can relax in Virgin Australia Lounge and Qantas Lounge; provided they have the membership or a pass. Car Rental Desks can be found at the Arrival areas of both the Terminal. Avis, Budget, Thrifty, Europcar, and Redspot are the car rental companies that offer services at this OOL Airport. Being associated with a range of car rental companies in Australia, we bring you the best and the widest fleet of rental cars at Gold Coast Airport; Car Rental companies at Gold Coast Airport include ACE and Thrifty. Our car rental service is available at every popular airport in the country; which means wherever you land in Australia, we will be there to serve you with our affordable car rental deals. Find some of the most famous airports in Australia from the list given below.